Dr. Tanios-Rafla performs more tongue tie releases per day than anyone in the state of New Jersey. She is the only “preferred Tongue Tie provider” for the state of New Jersey on a national database (Tongue-Tie & Lip-Tie Support Network – see the directory Click here). We do a full examination on each patient and determine that patient’s individual’s needs before giving the option of treatment. If treatment is recommended, we can perform the procedure the same day in most cases, especially because many of our patients drive from several hours away. We would be honored to care for your child and help you through understanding more about this misunderstood condition. Ankyloglossia, also known as tongue-tied, is a hereditary oral defect, which may decrease mobility of the tongue, which is caused by an unusually short lingual frenulum. 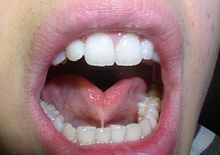 The lingual frenulum is a membrane, which connects the underside of the tongue, to the floor of the mouth. Ankyloglossia varies in degree of severity from mild cases that are characterized by mucous membrane bands, to complete ankyloglossia wherein the tongue is bound to the floor of the mouth. Untreated tongue-tie issues are not to be taken lightly, the consequences of unrepaired tongue-tie do not reduce over time, instead, more difficulties are experienced as time passes on. For infants and mothers, an untreated tongue-tie leads to numerous issues, notably, the inability for the infant to breastfeed successfully and painful breasts for the mother. Children also have to contend with difficulties due to an unresolved tongue-tie issue. Those issues range from inability to chew properly, to speech and dental hygiene issues. Furthermore, adults will have built bad habits to compensate for inadequate tongue mobility. Also one will continue to have social, speech, and dental hygiene issues. Upon initial observation of a child with tongue-tie, the cosmetic appearance of the tongue-tie will stand out. The tongue may look small, rounded, and indented in the midline with a heart-shaped look. As the child grows older, the appearance can change and the tongue may look square, thick, and too large for the mouth, causing it to curl up at the sides. The tie itself can vary from a thin elastic membrane, to a thickened, white, non-elastic tissue. Saliva buildup due to inadequate coordination of swallowing during speech becomes both visually and audibly obvious. Habits of mouth breathing also become obvious. Poor oral and dental hygiene caused by a limitation in lingual mobility or habitual incorrect tongue posture usually accompany messy eating habits, with food debris remaining on teeth and lips, causing dental decay. Excessive saliva is another issue that is a result of tongue-tie. Younger children will most likely be seen dribbling profusely, adults will adapt and keep the oral aperture small during speech, therefore reducing the length of utterances, or slurping loudly. Involuntary splashing of saliva during speech occurs frequently and embarrassingly. When speech problems occur, it is difficult to correct by conventional means of learning because the person cannot memorize the correct movements of speech, or even be sure of always achieving them. Both children and adults often try to speak with a small oral aperture, so that they can make the lingual contacts required for pronouncing consonants. Others will speak slowly, softly, or loudly. Nearly all patients past toddler stage are aware of the movements their tongue cannot make. Clarity in rapid speech is almost always impossible for a tongue-tied person to achieve. The total effect of these barriers in the way of normal development all too often have negative repercussions on self-esteem, confidence, emotions, and behavior. Once past infancy, our interactions with people are increasingly verbal. We communicate through speech and body language; therefore, it hardly needs to be stressed that if our verbal messages are not received and understood, we can become isolated. This issue can lead children and adults to lack self-confidence, and sometimes even fail to achieve the success that brings financial and social comfort.